Bring beer or wine to a party? Nice gesture. 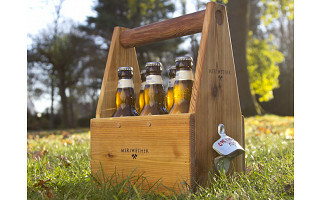 Bring beer or wine in a handcrafted wooden carrier? That’s how to really raise the bar. Rustic and utilitarian, Danny Brown’s beverage carriers are a perfect option when plain paper sacks and weak cardboard carriers won’t cut it. He started making the carriers out of scraps from his kayak/canoe paddle-making business. Danny’s side work took off, and he launched Meriwether of Montana, which is named for Meriwether Lewis, one half of the epic explorer duo Lewis and Clark. Danny’s Classic Six Pack Carrier is handcrafted from western red cedar and finished with linseed oil. With a handy side-mounted bottle opener, it’s perfect for toting home-brewed beer or a variety pack of your favorite bottles. The Wine Carrier holds two bottles and has a spot for a corkscrew. The Growler Carrier makes it easy to transport a local microbrew without having to use the growler’s awkward single-finger handle. Show up with any of these reusable carriers and you’ll be a favorite on every host’s guest list. Danny also makes a classic cedar tree swing, trimmed with walnut. His outdoor swing has the same nostalgic, charming appeal as his beverage caddies. It might just be the best seat in the house. Hello everyone. Thanks to Daily Grommet for making Meriwether of Montana a part of their great website. Please enjoy our handcrafted products that are being featured today. Our designs are intended to be simple, classic and nostalgic... things we all could use a bit more of. We are hard at work in our wood studio in Montana today but will be checking in to answer any questions you may have. Enjoy! Love the look and idea of your carriers. I'm thinking the 6-pack carrier would make a perfect 75th birthday gift for my good buddy who lives here in Oregon but has deep Montana roots. Question: in addition to the logo and the name/word "Meriwether", could you add a line "Proudly made in Montana" or some just "Montana Made", to customize the unit for a lover of all-things Montana? (P.S. my wife grew up in the Bitterroot Valley, so we have roots too!) Thanks! @ Ken Green: Awesome! Stay tune; checking with Danny about your customizing request. 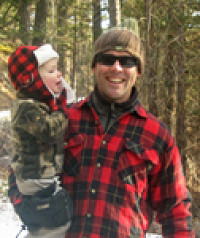 @ Ken Green - Glad to hear you love what we are doing. Sorry, but we do not have a brander that says Made in Montana. Great idea, though. Its probably something we should consider having made at some point... Take care. Danny B. Bring beer or wine to a party? Nice gesture. 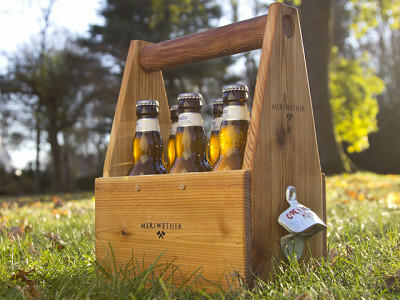 Bring beer or wine in a handcrafted wooden carrier? That’s how to really raise the bar. Rustic and utilitarian, Danny Brown’s beverage carriers are a perfect option when plain paper sacks and weak cardboard carriers won’t cut it. He started making the carriers out of scraps from his kayak/canoe paddle-making business. Danny’s side work took off, and he launched Meriwether of Montana, which is named for Meriwether Lewis, one half of the epic explorer duo Lewis and Clark. Danny’s Classic Six Pack Carrier is handcrafted from western red cedar and finished with linseed oil. With a handy side-mounted bottle opener, it’s perfect for toting home-brewed beer or a variety pack of your favorite bottles. The Wine Carrier holds two bottles and has a spot for a corkscrew. The Growler Carrier makes it easy to transport a local microbrew without having to use the growler’s awkward single-finger handle. Show up with any of these reusable carriers and you’ll be a favorite on every host’s guest list.